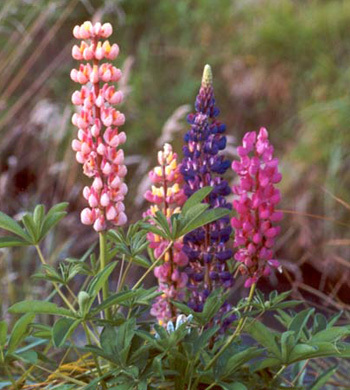 I first introduced lupins into the Moosey garden by collecting seeds by the road near Arthurs Pass. From these beginnings I enjoyed a mixture of colours, mainly violets and pinks. 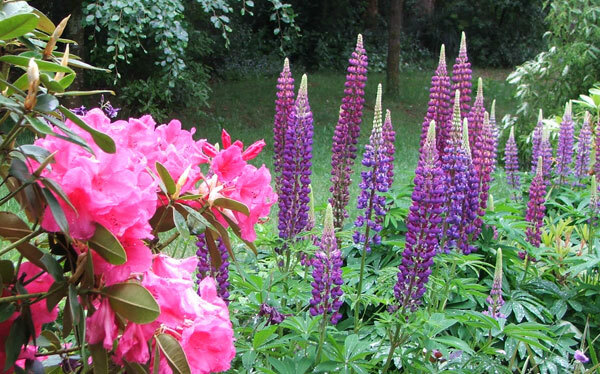 Lupins in my garden are treated both as short-lived perennials and flowers needing replacement, being re-sown annually from seed which they always generously provide. I find the seeds easy to germinate, and seedlings don't seem to mind being transplanted. If any flower stalks get blown down in the wind they get popped into a house vase to look beautiful inside. Ecologically speaking, these flowers are beautiful nuisances, and they spread along the braided river waterways in the South Island of New Zealand. 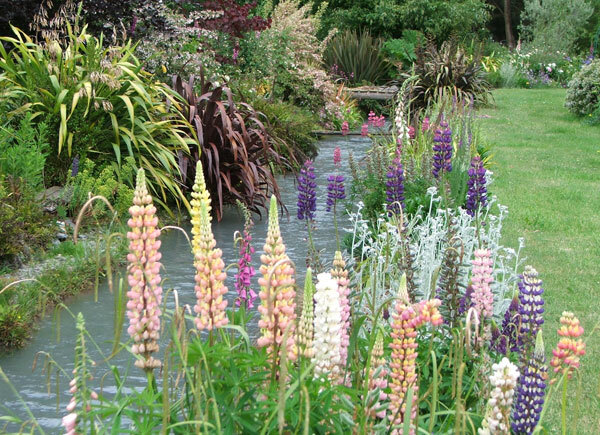 I try to deadhead my lupins and scatter their seeds where I want them to grow, keeping them away from the water race. Lupins are perennials, but plants do lose vigour, and my method of seed disposal is an attempt to guarantee new stock. I particularly love the blue, purple and pink tones. During a subtle colour phase (all gardeners seem to go through these) I proudly bought some pale lemon coloured plants from a nursery. That patch, planted by Middle Path, disappeared after its first flowering year, and I lived in hope that new pale lemon seedlings would emerge - they didn't. So I learnt that spending money on lupin plants was a bit of a waste. Better to create my own! To increase my collection I also take cuttings of new shoots in spring, pot them up, then wait for them to flower. This is a most successful way to propagate my favourite lupin colours. Refrain from buying or planting Russell lupin seed or plants. Avoid picking or transporting lupin seed heads between places.